BC Buzz Honey and Ezee Hoarding are two local businesses nominated in the Small Business BC Awards. Nov. 26, 2017 3:30 p.m. He owns a successful sign and lighting company (Chris’ Signs) and in 2013 decided he needed a hobby. 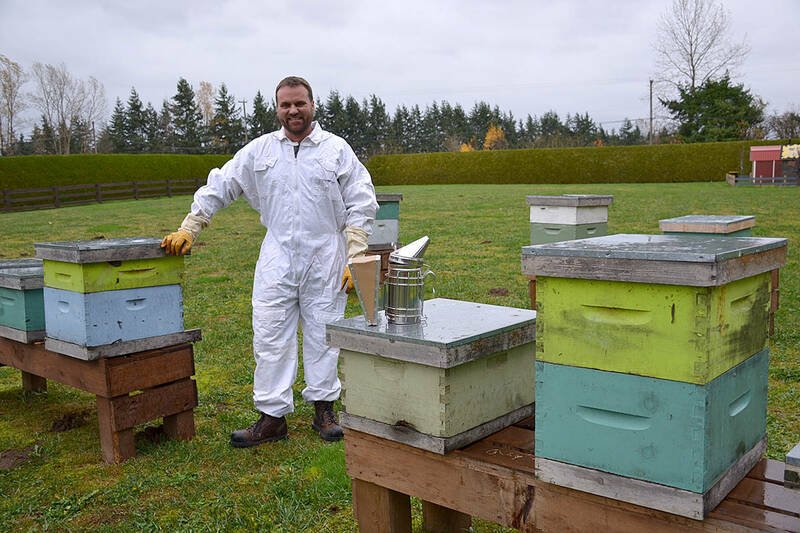 He took a beekeeping course and instead of leaving a hobby as a hobby, he partnered up with Kris Friesen, and the two started BC Buzz Honey. Following in the footsteps of the sign and lighting business, the honey business is now up for an award in the Small Business BC Awards. This time around the nomination is in the best marketer category, and Davies feels they have a fair shot at winning because it’s the marketing that sets BC Buzz Honey apart. At the entrance to the property where the businesses are located, visitors will find a small shack complete with a honey vending machine. Davies noted the traffic in the summer months is high and many visitors have commented on the unique, fun signage, labelling and display of the products. There are a number of hives on the property – visible from the honey shack in fact – but Chris and Kris also gather honey from other beekeepers to ensure supply and unique varieties of honey are available. In addition to being sold on site, their honey is also available in more than 60 retail locations. 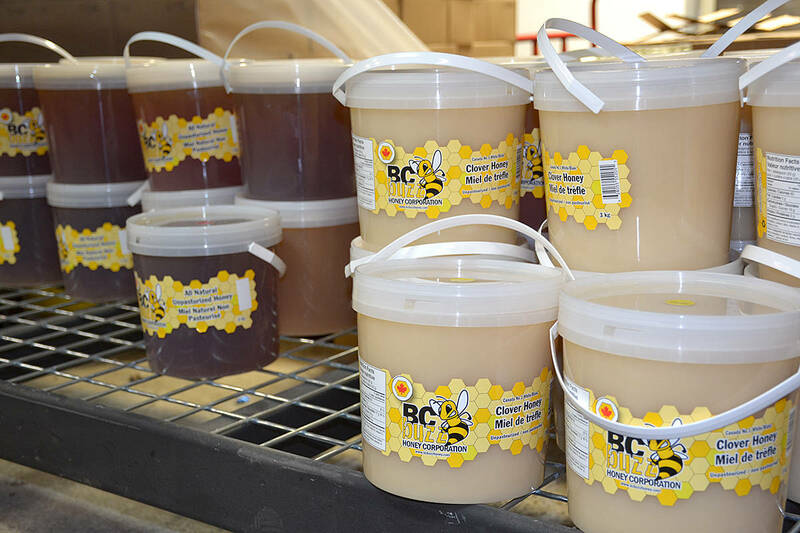 BC Buzz has hosted a number of tours on site, which is also where the unpasteurized honey is processed and bottled. Church groups, Boy Scout troops, even Kwantlen Polytechnic University’s beekeeping students have all stopped in for a visit. He added that the company also supports organizations like the Neurological Wellness Association, which uses BC Buzz Honey as a fundraiser. “It’s an honour to be nominated,” Davies noted. Another local business up for three awards is Ezee Hoarding, nominated for best community impact, best innovation, and the premier’s people’s choice. Kyle Olinek and his dad Glenn are co-owners of the company that is working to reduce the amount of construction material heading to landfills. To date, Kyle feels the company has diverted about 200,000 pounds of waste away from the dump. In the past, this interior hoarding has been done with drywall and steel studs, which are costly, heavy and turn into waste. With Ezee Hoarding’s unique PVC product, the tongue-and-groove walls are reusable, easy to set-up and accept graphics without paint or damage. “We’re helping by reducing waste going to our landfills,” he said. Other nominees in the Langley area include: Local Space, Luachmhar, In Awe Roofing, Vancouver Prostyle Contractors Ltd., Lilian Cazacu Notary Corp., Langley Pos-Abilities, Peregrine House Montessori, Langley Community Farmers Market, Lavender Counselling and Grove Pharmacy. Nominations for the 10 categories close Thursday, Nov. 30 with winners being announced at the Small Business BC Awards gala on Feb 23.